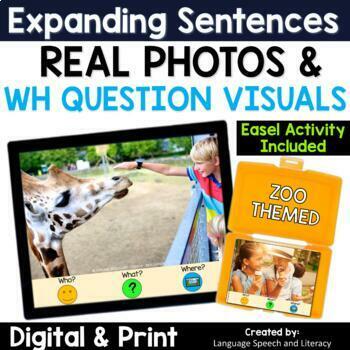 This no print zoo animal activity with real photos is great for teaching vocabulary, pronouns, verbs, wh questions, and simple sentences. 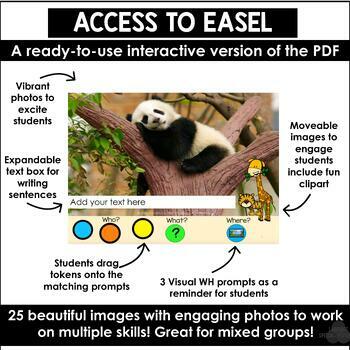 It is easy to download to any digital device such as the iPad, eBook, computer, smart board, etc. for use. These activities are great for teletherapy and mixed groups. *These photo scenes may be used for a variety of purposes such as asking and answering questions, conversation starters for students working on carry over of skills in articulation and fluency, sentence formulation and expansion, eliciting a language sample, etc. 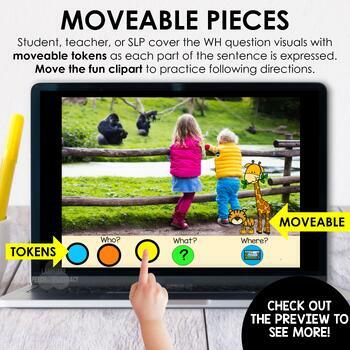 There are no digital interactive features with these activities. *24 pages of colored REAL PHOTOS for digital platform (iPad, computer, whiteboard, teletherapy platform). *Visuals are provided to teach the pronouns he, she and they. *Sentence strip is included for eliciting sentences. *1 sets of 24 cards that are 3.5” x 2.5” . pointing to the cue shapes at the bottom of the page. 2. Make 2 copies of cards for matching games. sentence strip may be used for eliciting sentences. Click HERE to follow me and be notified when new products are uploaded. New products are always 50% off for the first 48 hours they are posted.